Room rates range from $165-$235 per night, double occupancy. All major credit cards are accepted. 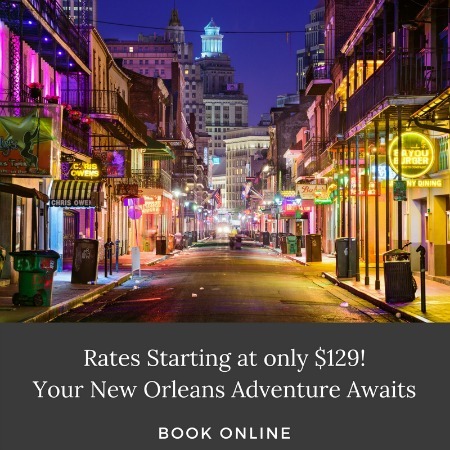 All rates are subject to Louisiana sales tax and are subject to change during special events. A two-night minimum is required on weekends. Smoking is permitted on the porch and balconies. Children under 12 and pets would be happier in a more conventional environment. A stay at the Grand Victorian makes a great anniversary or birthday gift, or a wonderful thank you for that terrific client or business associate. They are available starting at $100 and in increasing increments of $50. Allow us to plan your special gift by calling (800) 977-0008 or use our online service. Purchase a gift certificate here. The Grand Victorian is happy to offer government and military rates for personal traveling on military business, upon request and with proper ID. AAA discounts are applied to the base rate. Guests must pay in full 60 days in advance of special event dates.Charges are fully refundable, minus one night, if reservation is canceled 60 days prior to beginning of stay, provided the room is subsequently filled. If the room goes unreserved, the entire amount of stay will be forfeited. Guests must pre-pay one night to guarantee their reservations, with the balance due upon check-in. There is a full refund of the 1 night deposit should the reservation be cancelled 10 days prior to check in. If cancelled less than 10 days, we will try to rerent the space/dates reserved. If we can, we'll refund your deposit minus $25 processing fee. If we cannot, we retain your entire deposit but there will be no additional charges made. Is permitted on the porch and balconies. Are arranged by appointment only. Please be sure to contact the innkeeper a few days in advance with your arrival time at the house. Check-out time is 11 a.m.
At Grand Victorian Bed & Breakfast, we are dedicated to protecting your privacy and safeguarding your personally identifiable information. Our main purpose in collecting your personal information is to provide you with a streamlined experience in making reservations at Grand Victorian Bed & Breakfast. We only collect information about you that we consider necessary for achieving this. Personally identifiable information is only obtained when making a reservation. We sometimes use data collection devices such as “cookies” on certain pages of the Site to measure effectiveness and safety. A “cookie” is a small file that gets placed on your hard-drive that helps us provide our services. You are free to decline cookies if you choose too. At Grand Victorian Bed & Breakfast, we take security seriously. When users make a reservation we use every precaution to safe guard it online and offline. Grand Victorian Bed & Breakfast may amend this Privacy Statement from time to time in order to meet changes in the regulatory environment, business needs, or to satisfy the needs of our guests, properties, strategic marketing partners, and service providers.